What does it mean to save a life? In the Mishna, it is said that anyone who saves a life is as if he saved an entire world. That’s the idea behind AEPi’s partnership with the JED Foundation, a nonprofit that exists to protect emotional health and prevent suicide for teens and young adults. The foundation was named after Donna & Phil Satow’s son Jed, who was lost to suicide in 1998. Since the year 2000, the organization has sought out to provide a uniform model for preventing suicide on campus, one of the leading causes of death of young adults. 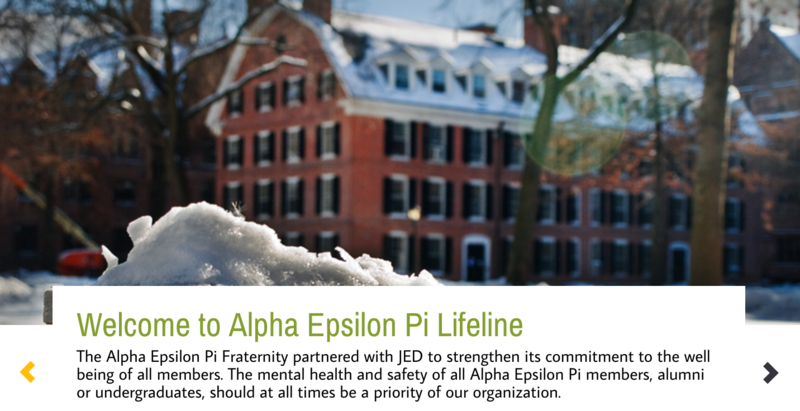 Equipped with a new website that offers services and tools aimed at suicide prevention and increasing mental health awareness, AEPi can firmly say that it now has the ability to provide help to those members in need. Immediately below, detailed sections offer videos and facts about emotional health, eating disorders and drug abuse. A section entitled ‘wellness’ offers healthy habits concerning sleep, exercise, nutrition, stress and even relationships from trusted sources. Brothers can then access campus specific resources to get the help they need, where they are, by locating their school. All access is anonymous and confidential. Although, those in need of help don’t always reach out for it on their own. That’s why aepi.ulifeline.org even teaches friends who are seeing their peers struggle emotionally how they can help, rather than stand idly by. Finally, the website offers a self evaluator. The test, developed by Duke School of Medicine, screens for thirteen of the most common mental health conditions that college students face. The screening doesn’t provide a diagnosis, but identifies problems that could be impacting thoughts, feelings and behaviors. Information on these conditions and how to reach out for help is then given to the Brother in need. Whether it’s religion, networking or business, Alpha Epsilon Pi has long served its members with the tools to build themselves into something greater. Mental health is now added to that list. Visit aepi.ulifeline.org to help yourself or a Brother in need.